The Labour Group on Breckland Council is calling for action on the lack of one and two bedroom properties in the District as the full implications of the so called ‘bedroom tax’ were revealed thanks to EDP research. 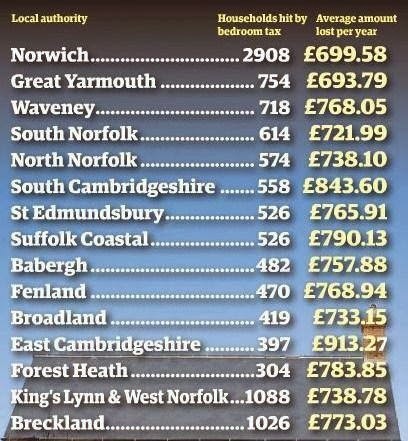 Figures published by the EDP show that the Breckland District has over 1,000 people affected by the Governments ‘spare room subsidy’ commonly known as the bedroom tax. On average, families have lost around £800 each as a result. Breckland has the third highest number of claimants in the EDPs circulation area, which reviewed 15 different Councils. Now, Labour Councillor Brenda Canham (Thetford-Abbey Ward) has submitted a motion to the next Breckland full Council meeting, which occurs on Thursday 19th December 2013. The motion calls on the authority to recognise the “significant impact that the spare room subsidy changes” are having in the Breckland area and “calls upon registered social landlords to do all that they can to ensure that there are suitable, smaller properties for people to move into, so that the impact of these changes is reduced”. The Labour Group claims that the number of claimants in the District is so high because there has been insufficient investment in social and affordable housing and there has not been enough focus on smaller properties, e.g. those with one or two bedrooms. This has resulted in people being forced into properties that are not suitable and they are now being unfairly penalised by the bedroom tax. Councillor Canham said; “We’re supposed to be an affluent area, but we have the third highest, nearly the second highest number of people affected by bedroom tax in this area. This is a cruel policy that is affecting some of the most disadvantaged people in society. The affect here in Breckland has been compounded by under-investment in social and affordable housing by Conservative controlled Breckland Council over many years. People have been forced into properties that are not suitable for them and they are now being penalised by this change and it is pushing many over the edge”. Councillor Canham points to a young girl aged 25 that lives on her ward and suffers from anxiety and depression. She applied for a two bedroom property, for herself and her two young children but there were none available. She was told to accept a three bedroom house or be removed from the Councils housing waiting list altogether. She’s now being hit by the bedroom tax and struggling to pay her bills, despite working as many hours as she can. The national Labour Party has pledged to scrap the bedroom tax should they return to power in 2015. “This Council recognises the significant impact that the spare room subsidy changes (commonly known as the 'bedroom tax') is having in the Breckland District. Council notes that figures obtained by the Eastern Daily Press show that 1,026 residents are being affected in this District with an average of £773.03 worth of support taken away from residents. This figure is the third highest out of fifteen neighbouring authorities in Norfolk, Suffolk and Essex. Council calls upon registered social landlords operating in the District to do all that they can to ensure that there are suitable, smaller properties for people to move in to, so that the impact of these changes is reduced. Furthmore, Council pledges to do all that it can, within a very difficult financial situation, to support this aim being achieved”.